An action group is fighting proposals to build 50 homes in Long Clawson which it says would ‘change the village beyond recognition’ if they went ahead. Davidsons Developments Limited wants to build the homes off Sandpit Lane and intends to submit an outline planning application to Melton Council in the near future. Objectors have formed the ‘Keep Clawson Long and Rural’ campaign group to oppose the plans. The group’s Facebook page says: “This development would increase the size of the village by 10 per cent. If action isn’t taken now then we shall see our village change beyond recognition. In a leaflet giving details of its plans Davidsons said it had consulted with residents and their feedback would be used to help shape its proposals. It says: “Nationally we are facing a growing housing shortage as people are living longer and in smaller households. “There are not enough houses being built to meet the demand and, as a result, there is a critical need to boost the supply of new homes. “Melton Council is preparing a new Local Plan to set out its strategy for future growth. The council has an agreed housing target of at least 245 dwellings per year until 2036. 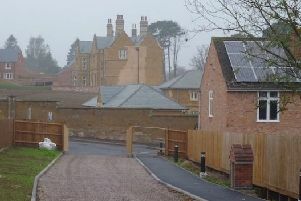 Long Clawson is identified as a large rural centre with a good range of facilities and is therefore a sustainable location for new housing development.